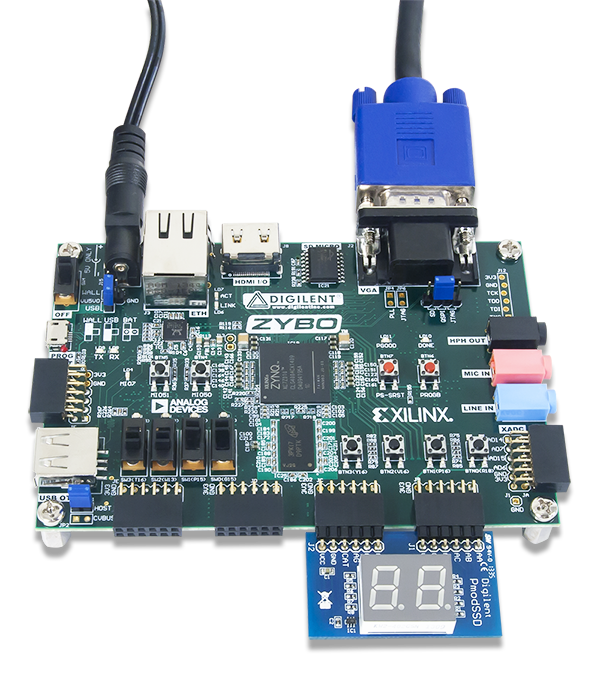 The ZYBO (ZYnq BOard) is a feature-rich, ready-to-use, entry-level embedded software and digital circuit development platform built around the smallest member of the Xilinx Zynq-7000 family, the Z-7010. The Z-7010 is based on the Xilinx All Programmable System-on-Chip (AP SoC) architecture, which tightly integrates a dual-core ARM Cortex-A9 processor with Xilinx 7-series Field Programmable Gate Array (FPGA) logic. When coupled with the rich set of multimedia and connectivity peripherals available on the ZYBO, the Zynq Z-7010 can host a whole system design. The on-board memories, video and audio I/O, dual-role USB, Ethernet, and SD slot will have your design up-and-ready with no additional hardware needed. Additionally, six Pmod ports are available to put any design on an easy growth path. An accessory kit that contains a 5V/2.5A power adapter, a USB A to Micro B cable, an 8GB speed class 10 microSD card, and a voucher to unlock the Xilinx SDSoC toolset is available to purchase separately off of the Digilent website. The SDSoC voucher unlocks a 1 year license and can only be used with the Zybo. After the license expires, any version of SDSoC that was released during this 1 year period can continue to be used indefinitely. Table 1. Zybo Device Diagram. 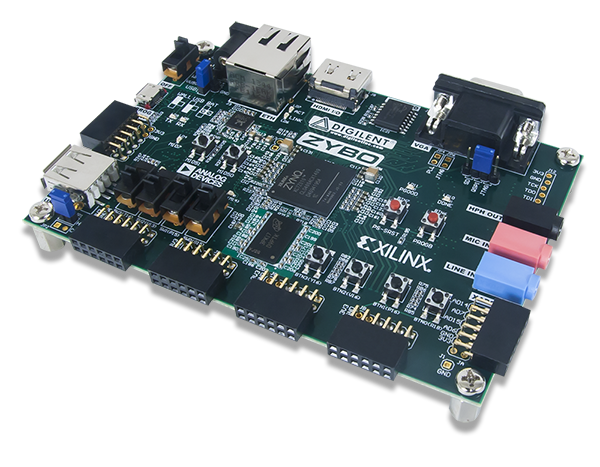 The ZYBO is fully compatible with Xilinx’s high-performance Vivado Design Suite. 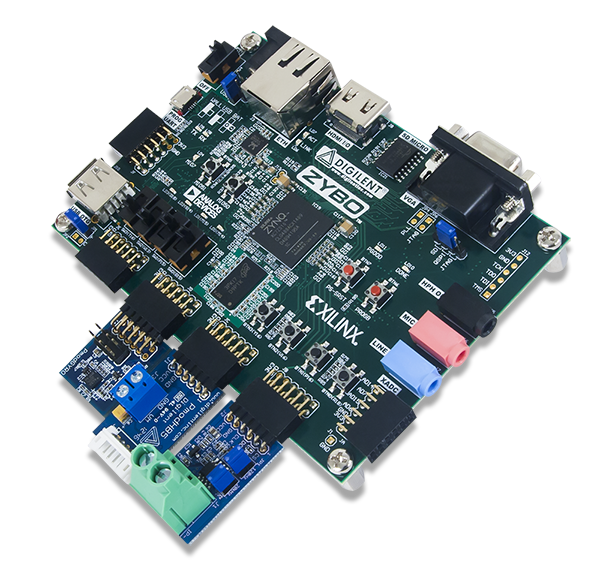 This toolset melds FPGA logic design with embedded ARM software development into an easy to use, intuitive design flow. It can be used for designing systems of any complexity, from a complete operating system running multiple server applications in tandem, down to a simple bare-metal program that controls some LEDs. As of Vivado release 2015.4, the Logic Analyzer and High-level Synthesis (HLS) features of Vivado are free to use for all WebPACK targets, which means you no longer need to use a voucher to unlock them with the ZYBO. The Logic Analyzer assists with debugging logic, and the HLS tool allows you to compile C code directly into HDL. Zynq platforms are well-suited to be embedded Linux targets, and ZYBO is no exception. To help you get started, Digilent provides a Petalinux project that will get you up and running with a Linux system quickly. For more information, see the ZYBO Resource Center. 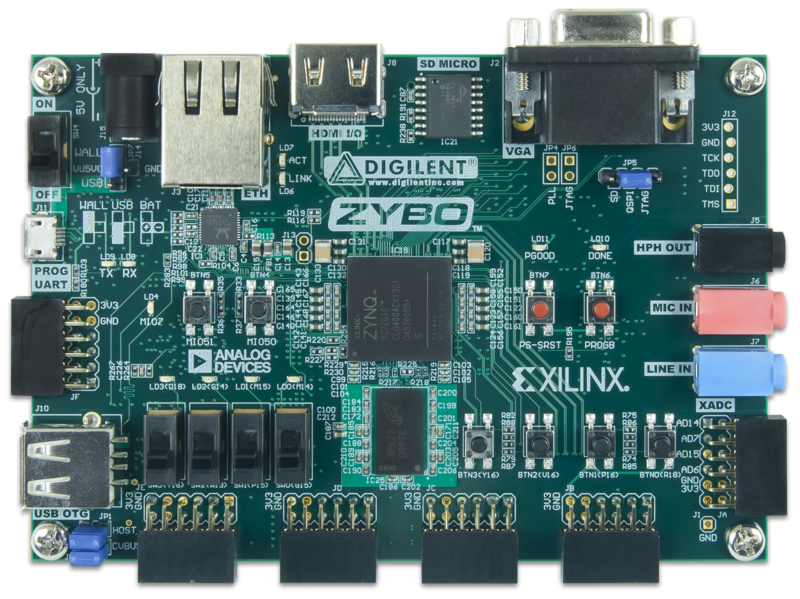 The ZYBO can also be used in Xilinx's SDSoC environment, which allows you to design FPGA accelerated programs with ease in an entirely C/C++ environment. For more information on SDSoC, see the Xilinx SDSoC Site. Digilent provides a video capable SDSoC platform for the ZYBO that is available from the ZYBO Resource Center. Those familiar with the older Xilinx ISE/EDK toolsets from before Vivado was released can also choose to use the ZYBO in that toolset. Digilent does not have many materials to support this, but you can always ask for help on the Digilent Forum. The ZYBO can be powered from the Digilent USB-JTAG-UART port (J11), or from an external power supply. Jumper JP7 (near the power switch) determines which power source is used. There are three valid configurations for this jumper corresponding to the three powering options: USB, wall wart with barrel jack, and battery pack. There is a diagram on the board silkscreen indicating all three. Figure 2. Power circuit overview. A USB 2.0 port can deliver maximum 0.5A of current according to the specifications. This should provide enough power for lower complexity designs. An idling blank board consumes around 0.2A from the 5V input supply. As an example, the standalone lwIP echo server sample project replying to ping requests consumes 0.38A on average. More demanding applications, including any that drive multiple peripheral boards or other USB devices, might require more power than the USB port can provide. In this case, power consumption will increase until it’s limited by the USB host. This limit varies a lot between manufacturers and depends on many factors. When in current limit, once the voltage rails dip below their nominal value, the Zynq is reset by the Power-on Reset signal and power consumption returns to its idle value. Also, some applications may need to run without being connected to a PC’s USB port. In these instances an external power supply or battery pack can be used. An external power supply (wall wart) can be used by plugging into to the power jack (J15) and setting jumper JP7 to “wall”. The supply must use a coax, center-positive 2.1mm internal-diameter plug, and deliver 4.5VDC to 5.5VDC and at least 2.5A of current (i.e., at least 12.5W of power). Suitable supplies can be purchased from the Digilent website or through catalog vendors like DigiKey. Power supply voltages above 6VDC might cause permanent damage. An external battery pack can be used by connecting the battery’s positive terminal to the center pin of JP7 and the negative terminal to the pin labeled J14 next to JP7. The external battery pack must be limited to 5.5VDC. The minimum voltage of the battery pack depends on the application: if the USB Host (J10) or HDMI Source (J8) function is used, at least 4.6V need to be provided. In other cases the minimum voltage is 3.6V. Voltage regulator circuits from Analog Devices create the required 3.3V, 1.8V, 1.5V, and 1.0V supplies from the main power input. Table 2 provides additional information (typical currents depend strongly on FPGA configuration and the values provided are typical of medium size/speed designs). Table 2. ZYBO power supplies. The supply rails are daisy-chained to follow the Xilinx-recommended start-up sequence. Flicking the power switch (SW4) will enable the 1.0V rail, which enables the 1.8V digital supply rail, which in turn enables the I/O supply rails 3.3V and 1.5V. The 1.25V reference and 1.8V analog supply ramp together with the 3.3V rail. Once all the channels of the ADP5052 (IC26) supply reach regulation, the PGOOD signal will assert, enabling the 3.3V audio supply, lighting up the power LED (LD11), and de-asserting the Power-On Reset signal (PS_POR_B) of the Zynq. The Zynq AP SoC is divided into two distinct subsystems: The Processing System (PS), and the Programmable Logic (PL). Figure 3 shows an overview of the Zynq AP SoC architecture, with the PS colored light green and the PL in yellow. 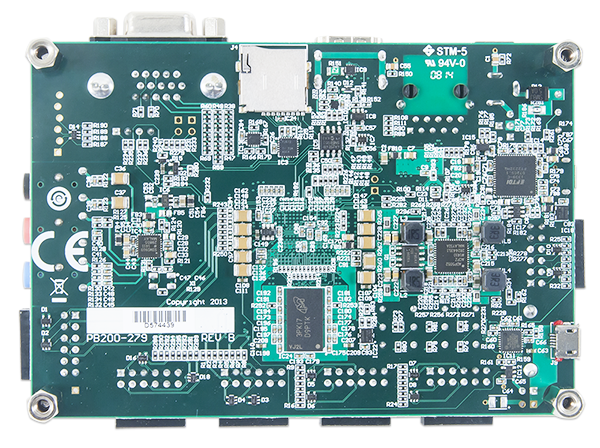 Note that the PCIe Gen2 controller and Multi-gigabit transceivers are not available on the Zynq-7010 device. The PS consists of many components, including the Application Processing Unit (APU, which includes 2 Cortex-A9 processors), Advanced Microcontroller Bus Architecture (AMBA) Interconnect, DDR3 Memory controller, and various peripheral controllers with their inputs and outputs multiplexed to 54 dedicated pins (called MultiplexedI/O, or MIO pins). Peripheral controllers that do not have their inputs and outputs connected to MIO pins can instead route their I/O through the PL, via the Extended-MIO (EMIO) interface. The peripheral controllers are connected to the processors as slaves via the AMBA interconnect, and contain readable/writable control registers that are addressable in the processors’ memory space. The programmable logic is also connected to the interconnect as a slave, and designs can implement multiple cores in the FPGA fabric that each also contain addressable control registers. Furthermore, cores implemented in the PL can trigger interrupts to the processors (connections not shown in Fig. 3) and perform DMA accesses to DDR3 memory. There are many aspects of the Zynq AP SoC architecture that are beyond the scope of this document. For a complete and thorough description, refer to the Zynq Technical Reference Manual, available at www.xilinx.com. Figure 3 depicts the external components connected to the MIO pins of the ZYBO. 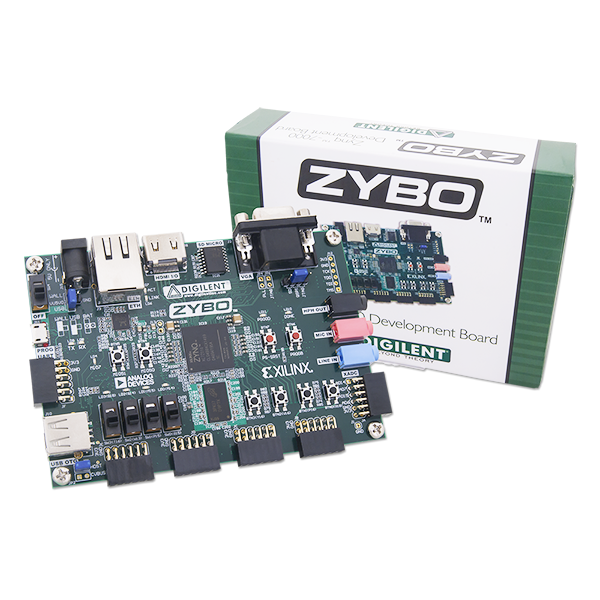 The Zynq Board Definition File found on the Digilent ZYBO product page can be imported into EDK and Vivado Designs to properly configure the PS to work with these peripherals. After the ZYBO is powered on or the Zynq is reset (in software or by pressing PS-SRST), one of the processors (CPU0) begins executing an internal piece of read-only code called the BootROM. If and only if the Zynq was just powered on, the BootROM will first latch the state of the mode pins into the mode register (the mode pins are attached to JP5 on the ZYBO). If the BootROM is being executed due to a reset event, then the mode pins are not latched, and the previous state of the mode register is used. This means that the ZYBO needs a power cycle to register any change in the programming mode jumper (JP5). Next, the BootROM copies an FSBL from the form of non-volatile memory specified by the mode register to the 256 KB of internal RAM within the APU (called On-Chip Memory, or OCM). The FSBL must be wrapped up in a Zynq Boot Image in order for the BootROM to properly copy it. The last thing the BootROM does is hand off execution to the FSBL in OCM. The Zynq Boot Image is created using Vivado and Xilinx Software Development Kit (Xilinx SDK). For a tutorial on how to build an image using these tools that properly targets the ZYBO, download the ZYBO Base System Design from the Digilent ZYBO resource center and follow the included documentation. The ZYBO supports three different boot modes: microSD, QSPI Flash, and JTAG. The boot mode is selected using the Mode jumper (JP5), which affects the state of the Zynq configuration pins after power-on. Figure 4 depicts how the Zynq configuration pins are connected on the ZYBO. Note that MIO2-MIO8 are shared with the QSPI Flash and MIO LED, but not pictured in Fig. 4. Figure 4. ZYBO configuration pins. Eject the microSD card from your computer and insert it into connector J4 on the ZYBO. Attach a power source to the ZYBO and select it using JP7. Turn the board on. The board will now boot the image stored in the QSPI flash. The ZYBO ships with a demonstration application pre-loaded into QSPI. For information on this image and how to restore it if erased, download the Factory Loaded Demo project from the ZYBO page at www.digilentinc.com. When placed in JTAG boot mode, the processor will wait until software is loaded by a host computer using the Xilinx tools. After software has been loaded, it is possible to either let the software begin executing, or step through it line by line using Xilinx SDK. The ZYBO Base System Design includes a tutorial for debugging software over JTAG in Xilinx SDK. It is also possible to directly configure the PL over JTAG, independent of the processor. This can be done using iMPACT or the Vivado Hardware Server. The ZYBO is configured to boot in Cascaded JTAG mode, which allows the PS to be accessed via the same JTAG port as the PL. It is also possible to boot the ZYBO in Independent JTAG mode by loading a jumper in JP6 and shorting it. This will cause the PS to not be accessible from the onboard JTAG circuitry, and only the PL will be visible in the scan chain. To access the PS over JTAG while in independent JTAG mode, users will have to route the signals for the PJTAG peripheral over EMIO, and use an external device to communicate with it. The ZYBO features a 4-bit SPI (quad-SPI) serial NOR flash. The Spansion S25FL128S is used on this board. The Multi-I/O SPI Flash memory is used to provide non-volatile code and data storage. It can be used to initialize the PS subsystem as well as configure the PL subsystem (bitstream). Spansion provides Spansion Flash File System (FFS) for use after booting the Zynq-7000 AP SoC. The SPI Flash connects to the Zynq-7000 AP SoC supporting up to Quad-I/O SPI interface. This requires connection to specific pins in MIO Bank 0/500, specifically MIO[1:6,8] as outlined in the Zynq datasheet. Quad-SPI feedback mode is used, thus qspi_sclk_fb_out/MIO is left to freely toggle and is connected only to a 20K pull-up resistor to 3.3V. This allows a QSPI clock frequency greater than FQSPICLK2. The ZYBO includes two Micron MT41J128M16JT-125 or MT41K128M16JT-125 DDR3 memory components creating a single rank, 32-bit wide interface and a total of 512MiB of capacity. The DDR3 is connected to the hard memory controller in the Processor Subsystem (PS), as outlined in the Zynq documentation. The PS incorporates an AXI memory port interface, a DDR controller, the associated PHY, and a dedicated I/O bank. DDR3 memory interface speeds up to 533 MHz/1066 Mbps are supported¹. The DDR3 uses 1.5V SSTL-compatible inputs. The two components are organized in a tree topology with a series termination scheme while keeping traces as short as possible and matched. ZYBO was routed with 40 ohm (+/-10%) trace impedance for single-ended signals, and differential clock and strobes set to 80 ohms (+/-10%). A feature called DCI (Digitally Controlled Impedance) is used to match the drive strength and termination impedance of the PS pins to the trace impedance. On the memory side, each chip calibrates its on-die termination and drive strength using a 240 ohm resistor on the ZQ pin. Both the memory chips and the PS DDR bank are powered from the 1.5V supply. The mid-point reference of 0.75V is created with a simple resistor divider and is available to the Zynq as external reference. For proper operation it is essential that the PS memory controller is configured properly. Settings range from the actual memory flavor to the board trace delays. For your convenience the board definition file provided on our website will automatically configure the correct parameters. For best DDR3 performance, DRAM training is enabled for write leveling, read gate, and read data eye options in the PS Configuration Tool in Xilinx tools. Training is done dynamically by the controller to account for board delays, process variations and thermal drift. Optimum starting values for the training process are the board delays (propagation delays) for certain memory signals. Board delays are specified for each of the byte groups. These parameters are board-specific and were calculated from the PCB trace length reports. The DQS to CLK Delay and Board Delay values are calculated specific to the ZYBO memory interface PCB design. For more details on memory controller operation, refer to the Xilinx Zynq TRM (ug585). ¹Maximum actual clock frequency is 525 MHz due to PLL limitation. The ZYBO includes an FTDI FT2232HQ USB-UART bridge (attached to connector J11) that lets you use PC applications to communicate with the board using standard Windows COM port commands. Free USB-COM port drivers, available from www.ftdichip.com under the “Virtual Com Port” or VCP heading, convert USB packets to UART/serial port data. Serial port data is exchanged with the Zynq using a two-wire serial port (TXD/RXD). After the drivers are installed, I/O commands can be used from the PC directed to the COM port to produce serial data traffic on the Zynq pins. The port is tied to PS (MIO) pins and can be used in combination with the UART 1 controller. A 3.3V→1.8V voltage level translation interfaces the FT2232 with MIO Bank 501, a process transparent to the user. The board definition file takes care of mapping the correct MIO pins to the UART 1 controller and uses the following default protocol parameters: 115200 baud rate, 1 stop bit, no parity, 8-bit character length. Two on-board status LEDs provide visual feedback on traffic flowing through the port: the transmit LED (LD9) and the receive LED (LD8). Signal names that imply direction are from the point-of-view of the DTE (Data Terminal Equipment), in this case the PC. The FT2232HQ is also used as the controller for the Digilent USB-JTAG circuitry, but the USB-UART and USB-JTAG functions behave entirely independent of one another. Programmers interested in using the UART functionality of the FT2232 within their design do not need to worry about the JTAG circuitry interfering with the UART data transfers, and vice-versa. The combination of these two features into a single device allows the ZYBO to be programmed, communicated with via UART, and powered from a computer attached with a single Micro USB cable. The ZYBO provides a microSD slot (J4) for non-volatile external memory storage as well as booting the Zynq. The slot is wired to Bank 1/501 MIO[40-47], including Card Detect. On the PS side peripheral SDIO 0 is mapped out to these pins and controls communication with the SD card. The pinout can be seen in Table 4. The peripheral controller supports 1-bit and 4-bit SD transfer modes, but does not support SPI mode. Based on the Zynq TRM, SDIO host mode is the only mode supported. The SD slot is a powered from 3.3V, but is connected through MIO Bank 1/501 (1.8V). Therefore, a TI TXS02612 level shifter performs this translation. The TXS02612 is actually 2-port SDIO port expander, but only its level shifter function is used. The connection diagram can be seen on Figure 6. Mapping out the correct pins and configuring the interface is handled by the ZYBO board definition file. Refer to section 3.1 for information on how to boot from an SD card. For more information, consult the Xilinx Zynq TRM (ug585). The ZYBO implements one of the two available PS USB OTG interfaces on the Zynq device. A Microchip USB3320 USB 2.0 Transceiver Chip with an 8-bit ULPI interface is used as the PHY. The PHY features a complete HS-USB Physical Front-End supporting speeds of up to 480Mbs. The PHY is connected to MIO Bank 1/501, which is powered at 1.8V. The usb0 peripheral is used on the PS, connected through MIO[28-39]. The USB OTG interface can act as an embedded host or a peripheral device. The USB mode is controlled from software by manipulating the USB0 peripheral controller in the Zynq. When acting as a peripheral, the USB Micro AB connector (J9) should be used to connect to a USB host device, and JP1 should not be shorted. When acting as an embedded host, the USB A connector (J10) should be used to connect to a USB peripheral device, and JP1 should be shorted. The ZYBO should never have a peripheral device and a host device connected to these two connectors at the same time. While in host mode, the ZYBO is technically an “embedded host”, because it does not provide the required 150 µF of capacitance on VBUS required to qualify as a general purpose host. It is possible to modify the ZYBO so that it complies with the general purpose USB host requirements by loading C64 with a 150 µF capacitor and shorting JP2. Only those experienced at soldering small components on PCBs should attempt this rework. Many USB peripheral devices will work just fine without loading C64. Whether the ZYBO is configured as an embedded host or a general purpose host, it can provide 500 mA on the 5V VBUS line. Note that if your design uses the USB OTG feature in host mode (embedded or general purpose), then the ZYBO should not be powered via USB (J11), but instead by a battery or wall adapter capable of providing more power. The ZYBO uses a Realtek RTL8211E-VL PHY to implement a 10/100/1000 Ethernet port for network connection. The PHY connects to MIO Bank 501 (1.8V) and interfaces to the Zynq-7000 AP SoC via RGMII for data and MDIO for management. The auxiliary interrupt (INTB) and reset (PHYRSTB) signals connect to PL pins to be accessed via EMIO. The connection diagram can be seen on Fig. 7. Two status indicator LEDs are on-board near the RJ-45 connector that indicate traffic (LD7) and valid link state (LD6). Table 5 shows the default behavior. Table 5. Ethernet status LEDs. The Zynq incorporates two independent Gigabit Ethernet Controllers. They implement a 10/100/1000 half/full duplex Ethernet MAC. Of these two, GEM 0 can be mapped to the MIO pins where the PHY interfaces. Since the MIO bank is powered from 1.8V, the RGMII interface uses 1.8V HSTL Class 1 drivers. For this I/O standard an external reference of 0.9V is provided in bank 501 (PS_MIO_VREF). Mapping out the correct pins and configuring the interface is handled by the ZYBO board definition file. The PHY is clocked from the same 50 MHz oscillator (IC22) that clocks the PS too. The parasitic capacitance of the two loads is low enough to be driven from a single source. On an Ethernet network each node needs a unique MAC address. To this end, a Microchip 24AA02E48 EEPROM is provided on the ZYBO. On one hand it is a read-writeable EEPROM that can be accessed via I2C. On the other hand it features a read-only memory section that comes pre-programmed with a unique identifier. This unique identifier can be read and used as a MAC address, avoiding a possible address conflict on the network. The I2C interface connects to the PL side and can be accessed from the PS over EMIO as well. The device address of the EEPROM is 1010000b. For more information on using the Gigabit Ethernet MAC, refer to the Xilinx Zynq TRM (ug585). An input and output-capable HDMI Port connects to the programmable logic pins. Over this connector an HDMI or DVI-compatible video stream can be driven in or out of the ZYBO. Encoding or decoding the HDMI/DVI video stream needs to be implemented in logic, as well as auxiliary functions, like DDC or CEC. Depending on the actual design, it can take the Source role driving a monitor/TV display, or behave as a Sink accepting a video stream from any HDMI/DVI Source, like a laptop or smartphone. On-board auxiliary buffers and electronic switches control the direction of signals that differ between Source and Sink. These signals are summarized Table 6. Table 6. HDMI signal direction in Source and Sink roles. The CEC function is bi-directional by definition, so it is treated the same no matter what role the port takes. If the CEC function is not used, declare it as input and constrain it to the correct PL pin to leave other devices on the CEC bus unaffected. When operating as Sink, the DDC function is required to be implemented so that a connected Source can read out important characteristics of the device. This can be done by emulating an I2C-capable EEPROM in programmable logic. Likewise, in Source mode DDC can be used to find out the capabilities of the connected display. The HDMI/DVI protocol uses TMDS (Transition-minimized differential signaling) as I/O standard. It is supported on Zynq by the I/O buffers on the programmable logic side. 50 ohm external parallel termination resistors are provided on-board. HDMI specifications only require terminations on the Sink side, but optional Source-side terminations reduce reflections, resulting in improved signal quality. Do not connect powered HDMI/DVI devices to an unpowered ZYBO, as it might result in back-powering the board through the termination resistors. Resolutions up to 720p (1280×720) have been tested. The ZYBO board uses 18 programmable logic pins to create an analog VGA output port. This translates to 16-bit color depth and two standard sync signals (HS – Horizontal Sync, and VS – Vertical Sync). The digital-to-analog conversion is done using a simple R-2R resistor ladder¹. The ladder works in conjunction with the 75-ohm termination resistance of the VGA display to create 32 and 64 analog signal levels red, blue, and green VGA signals. This circuit, shown in Fig. 8, produces video color signals that proceed in equal increments between 0V (fully off) and 0.7V (fully on). With 5 bits each for red and blue and 6 bits for green, 65,536 (32×32×64) different colors can be displayed, one for each unique 16-bit pattern. Figure 8. ZYBO VGA circuit. VGA signal timings are specified, published, copyrighted, and sold by the VESA organization (www.vesa.org). The following VGA system timing information is provided as an example of how a VGA monitor might be driven in 640 by 480 mode. NOTE: For more precise information, or for information on other VGA frequencies, refer to documentation available at the VESA website. CRT-based VGA displays use amplitude-modulated moving electron beams (or cathode rays) to display information on a phosphor-coated screen. LCD displays use an array of switches that can impose a voltage across a small amount of liquid crystal, thereby changing light permittivity through the crystal on a pixel-by-pixel basis. Although the following description is limited to CRT displays, LCD displays have evolved to use the same signal timings as CRT displays (so the “signals” discussion below pertains to both CRTs and LCDs). Color CRT displays use three electron beams (one for red, one for blue, and one for green) to energize the phosphor that coats the inner side of the display end of a cathode ray tube (see Fig. 9). Figure 9. Color CRT display. Electron beams emanate from “electron guns” which are finely-pointed heated cathodes placed in close proximity to a positively charged annular plate called a “grid.” The electrostatic force imposed by the grid pulls rays of energized electrons from the cathodes, and those rays are fed by the current that flows into the cathodes. These particle rays are initially accelerated towards the grid, but they soon fall under the influence of the much larger electrostatic force that results from the entire phosphor-coated display surface of the CRT being charged to 20kV (or more). The rays are focused to a fine beam as they pass through the center of the grids, and then they accelerate to impact on the phosphor-coated display surface. The phosphor surface glows brightly at the impact point, and it continues to glow for several hundred microseconds after the beam is removed. The larger the current fed into the cathode, the brighter the phosphor will glow. Between the grid and the display surface, the beam passes through the neck of the CRT where two coils of wire produce orthogonal electromagnetic fields. Because cathode rays are composed of charged particles (electrons), they can be deflected by these magnetic fields. Current waveforms are passed through the coils to produce magnetic fields that interact with the cathode rays and cause them to transverse the display surface in a “raster” pattern, horizontally from left to right and vertically from top to bottom, as shown in Fig. 10. As the cathode ray moves over the surface of the display, the current sent to the electron guns can be increased or decreased to change the brightness of the display at the cathode ray impact point. Information is only displayed when the beam is moving in the “forward” direction (left to right and top to bottom), and not during the time the beam is reset back to the left or top edge of the display. Much of the potential display time is therefore lost in “blanking” periods when the beam is reset and stabilized to begin a new horizontal or vertical display pass. The size of the beams, the frequency at which the beam can be traced across the display, and the frequency at which the electron beam can be modulated determine the display resolution. Modern VGA displays can accommodate different resolutions, and a VGA controller circuit dictates the resolution by producing timing signals to control the raster patterns. The controller must produce synchronizing pulses at 3.3V (or 5V) to set the frequency at which current flows through the deflection coils, and it must ensure that video data is applied to the electron guns at the correct time. Raster video displays define a number of “rows” that corresponds to the number of horizontal passes the cathode makes over the display area, and a number of “columns” that corresponds to an area on each row that is assigned to one “picture element”, or pixel. Typical displays use from 240 to 1200 rows and from 320 to 1600 columns. The overall size of a display and the number of rows and columns determines the size of each pixel. Figure 10. VGA horizontal synchronization. Video data typically comes from a video refresh memory; with one or more bytes assigned to each pixel location (the ZYBO uses 16 bits per pixel). The controller must index into video memory as the beams move across the display, and retrieve and apply video data to the display at precisely the time the electron beam is moving across a given pixel. A VGA controller circuit must generate the HS and VS timings signals and coordinate the delivery of video data based on the pixel clock. The pixel clock defines the time available to display one pixel of information. The VS signal defines the “refresh” frequency of the display, or the frequency at which all information on the display is redrawn. The minimum refresh frequency is a function of the display’s phosphor and electron beam intensity, with practical refresh frequencies falling in the 50Hz to 120Hz range. The number of lines to be displayed at a given refresh frequency defines the horizontal “retrace” frequency. For a 640-pixel by 480-row display using a 25MHz pixel clock and 60 +/-1Hz refresh, the signal timings shown in Fig. 11 can be derived. Timings for sync pulse width and front and back porch intervals (porch intervals are the pre- and post-sync pulse times during which information cannot be displayed) are based on observations taken from actual VGA displays. A VGA controller circuit, such as the one diagramed in Fig. 12, decodes the output of a horizontal-sync counter driven by the pixel clock to generate HS signal timings. You can use this counter to locate any pixel location on a given row. Likewise, the output of a vertical-sync counter that increments with each HS pulse can be used to generate VS signal timings, and you can use this counter to locate any given row. These two continually running counters can be used to form an address into video RAM. No time relationship between the onset of the HS pulse and the onset of the VS pulse is specified, so you can arrange the counters to easily form video RAM addresses, or to minimize decoding logic for sync pulse generation. Figure 12. VGA display controller block diagram. The ZYBO provides a 50 MHz clock to the Zynq PS_CLK input, which is used to generate the clocks for each of the PS subsystems. The 50 MHz input allows the processor to operate at a maximum frequency of 650 MHz and the DDR3 memory controller to operate at a maximum of 525 MHz (1050 Mbps). The ZYBO Base System Design configures the PS to work properly with this input clock, and should be used as a reference when creating custom designs. The PS has a dedicated PLL capable of generating up to four reference clocks, each with settable frequencies, that can be used to clock custom logic implemented in the PL. Additionally, The ZYBO provides an external 125 MHz reference clock directly to pin L16 of the PL. The external reference clock allows the PL to be used completely independently of the PS, which can be useful for simple applications that do not require the processor. Figure 13 outlines the clocking scheme used on the ZYBO. Note that the reference clock output from the Ethernet PHY is used as the 125 MHz reference clock to the PL, in order to cut the cost of including a dedicated oscillator for this purpose. Keep in mind that CLK125 will be disabled when the Ethernet PHY (IC1) is held in hardware reset by driving the PHYRSTB signal low. The ZYBO board includes four slide switches, four push buttons, and four individual LEDs connected to the Zynq PL, as shown in Fig. 14. There are also two additional pushbuttons and one LED connected directly to the PS via MIO pins, also shown in Fig. 14. The pushbuttons and slide switches are connected to the Zynq via series resistors to prevent damage from inadvertent short circuits (a short circuit could occur if a pin assigned to a pushbutton or slide switch was inadvertently defined as an output). The pushbuttons are “momentary” switches that normally generate a low output when they are at rest, and a high output only when they are pressed. Slide switches generate constant high or low inputs depending on their position. On the analog side, the codec connects to three 3.5 mm standard audio jacks. There are two inputs: a mono microphone and a stereo line in. There is one stereo output, the headphone jack. Analog power is provided by a dedicated linear power supply (IC6). Table 8. Digital audio signals, with the SSM2603 in default slave mode. The audio codec needs to be clocked from the Zynq on the MCLK pin. This master clock will be used by the audio codec to establish the audio sampling frequency. This clock is required to be an integer multiple of the desired sampling rate. The default settings require a master clock of 12.288 Mhz, resulting in a 48 kHz sampling rate. For other frequencies and their respective configuration parameters, consult the SSM2603 datasheet. The codec has two modes: master and slave, with the slave being default. In this mode, the direction of the signals is specified in Table 8. When configured as master, the direction of BCLK, PBLRC and RECLRC is inverted. In this mode, the codec generates the proper frequencies for these clocks. No matter where are the clocks are generated, PBDAT needs to be driven out and RECDAT sampled in sync with them. The master clock is always driven out of the Zynq. The timing diagram of an I²S stream can be seen on Figure 15. Note the one-cycle delay of the data stream with respect to the left/right clock changing state. Audio samples are transmitted MSB first, noted as 1 in the diagram. Figure 15. I²S timing diagram. The Zynq PS supports external power-on reset signals. The power-on reset is the master reset of the entire chip. This signal resets every register in the device capable of being reset. The ZYBO drives this signal from a comparator that holds the system in reset until all power supplies are valid. Several other IC’s on the ZYBO are reset by this signal as well. A PROG push switch, BTN6, toggles Zynq PROG_B. This resets the PL and causes DONE to be de-asserted. The PL will remain unconfigured until it is reprogrammed by the processor or via JTAG. The external system reset, labeled PS_SRST/BTN7, resets the Zynq device without disturbing the debug environment. For example, the previous break points set by the user remain valid after system reset. Due to security concerns, system reset erases all memory content within the PS, including the OCM. The PL is also cleared during a system reset. System reset does not cause the boot mode strapping pins to be re-sampled. Pmod ports are 2×6, right-angle, 100-mil spaced female connectors that mate with standard 2×6 pin headers. Each 12-pin Pmod port provides two 3.3V VCC signals (pins 6 and 12), two Ground signals (pins 5 and 11), and eight logic signals, as shown in Fig. 16. The VCC and Ground pins can deliver up to 1A of current, but care must be taken not to exceed any of the power budgets of the onboard regulators or the external power supply. Digilent produces a large collection of Pmod accessory boards that can attach to the Pmod expansion connectors to add ready-made functions like A/D’s, D/A’s, motor drivers, sensors, and other functions. See www.digilentinc.com for more information. The ZYBO has six Pmod ports, some of which behave differently than others. Each Pmod port falls into one of four categories: standard, MIO connected, XADC, or high-speed. Table 9 specifies which category each Pmod falls into, and also lists the Zynq pins they are connected to. The following sections describe the different types of Pmods. The standard Pmod port is connected to the PL of the Zynq via 200 Ohm series resistors. The series resistors prevent short circuits that can occur if the user accidently drives a signal that is supposed to be used as an input. The downside to this added protection is that these resistors can limit the maximum switching speed of the data signals. If the Pmod being used does not require high-speed access, then the standard Pmod port should be used to help prevent damage to the devices. The MIO Pmod port is connected to the MIO bus in the PS of the Zynq via 200 Ohm series resistors. Like the standard Pmod port, these series resistors add protection at the cost of maximum switching speed. Since these data signals are connected to the MIO interface, they can only be accessed by the PS peripheral controller cores. The GPIO, UART, I2C, and SPI cores can all be used to drive devices connected to this Pmod. Note that the pin layout of the UART and I2C cores will not align perfectly with the typical Pmod pinouts for these interfaces. This means that UART or I2C devices connected to this Pmod may require some of the pins to be swapped around externally using individual wires between the ZYBO and the Pmod. The on-board Pmod expansion connector labeled “JA” is wired to the auxiliary analog input pins of the PL. Depending on the configuration, this connector can be used to input differential analog signals to the analog-to-digital converter inside the Zynq (XADC). Any or all pairs in the connector can be configured either as analog input or digital input-output. The Dual Analog/Digital Pmod on the ZYBO differs from the rest in the routing of its traces. The eight data signals are grouped into four pairs, with the pairs routed closely coupled for better analog noise immunity. Pins 1 and 7, pins 2 and 8, pins 3 and 9, and pins 4 and 10 are paired up. Furthermore, each pair has a partially loaded anti-alias filter laid out on the PCB. The filter does not have capacitors C94-C97. In designs where such filters are desired, the capacitors can be manually loaded by the user. The XADC core within the Zynq is a dual channel 12-bit analog-to-digital converter capable of operating at 1 MSPS. Either channel can be driven by any of the auxiliary analog input pairs connected to the JXADC header. The XADC core is controlled and accessed from the PL via the Dynamic Reconfiguration Port (DRP). The DRP also provides access to voltage monitors that are present on each of the FPGA’s power rails, and a temperature sensor that is internal to the FPGA. For more information on using the XADC core, refer to the Xilinx document titled “7 Series FPGAs and Zynq-7000 All Programmable SoC XADC Dual 12-Bit 1 MSPS Analog-to-Digital Converter.” It is also possible to access the XADC core directly using the PS, via the “PS-XADC” interface. This interface is described in full in chapter 30 of the Zynq Technical Reference Manual. The High-speed Pmods use the standard Pmod port, but have their data signals routed as impedance matched differential pairs for maximum switching speeds. They have pads for loading resistors for added protection, but the ZYBO ships with these loaded as 0-Ohm shunts. With the series resistors shunted, these Pmods offer no protection against short circuits, but allow for much faster switching speeds. The signals are paired to the adjacent signals in the same row: pins 1 and 2, pins 3 and 4, pins 7 and 8, and pins 9 and 10. Traces are routed 100 ohm (+/- 10%) differential. These connectors should be used only when high speed differential signaling is required or the other Pmods are all occupied. If used as single-ended, coupled pairs will have significant crosstalk. In applications where this is a concern, the standard Pmod port shall be used. Another option would be to ground one of the signals (drive it low from the FPGA) and use its pair for the signal-ended signal.